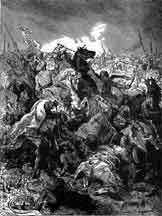 The Ottomans suffered an overwhelming defeat at the battle of Zenta on September 11, 1697. Prince Eugene of Savoy the commander of Imperial troops in Hungary killed 20,000 Ottomans captured the Ottoman treasury, all of its artillery and provisions and 10 of theSultans wives. After the battle the treaty of Karlowitz is signed in which the Ottomans are forced to cede Croatia, Hungary Transilvania and Sovenia to Austria.